Diamond/Pearl It swims by rotating its two tails like a screw. When it dives, its flotation sac collapses. Platinum It spins its two tails like a screw to propel itself through water. The tails also slice clinging seaweed. 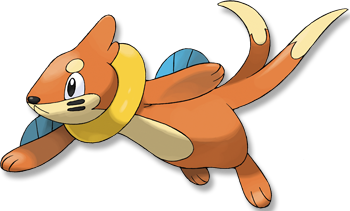 Heart Gold It inflates its flotation sac, keeping its face above water in order to watch for prey movement. Soul Silver It inflates its flotation sac, keeping its face above water in order to watch for prey movement. Black It spins its two tails like a screw to propel itself through water. The tails also slice clinging seaweed. White It spins its two tails like a screw to propel itself through water. The tails also slice clinging seaweed.